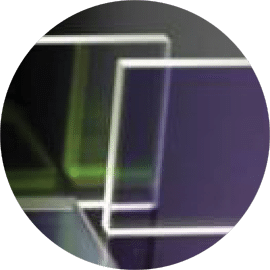 Shanghai Optics is a leading supplier of custom made Dichroic Polarizers. A unique design and proprietary manufacturing approach gives these Dichroic Plate Beamsplitters the steepest edges and flattest, highest reflection and transmission bands. More complete transmission and reflection means less stray light gets through the imaging system, yielding higher contrast images and better signal-to-noise ratio. Dichroic Beamsplitters are critical components in fluorescence microscopy, genomics, proteomics, gel plate and microplate readers, as well as in general OEM instrumentation requiring beam separation, beam combination, or multi-spectral detection. These Beamsplitters can also be used as highly efficient Bandpass Filters, and may be used in conjunction with our Shortpass Filters to create custom narrow Bandpass Filters.